According to a Gallup poll conducted between April 6-10 of this year, 46 percent of Americans have no money invested in the stock market – not in individual stocks or stock mutual funds or self-directed 401(k)s or IRAs. The amount of Americans with zero money invested in the stock market has grown by 12 percentage points since April of 2007. That was the year before century-old iconic names on Wall Street began blowing up like a smoldering stack of Roman candles at a fireworks factory and the U.S. Treasury and Federal Reserve hooked up a bulging firehose to douse the inferno that ended up doubling the national debt over the ensuing years and multiplied the Fed’s balance sheet five-fold. 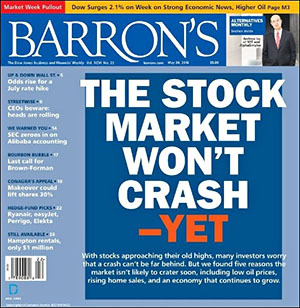 In the same article, the writer quotes Ian Scott of Lehman Brothers predicting that “the stock market likely would fall no more than 10% to 15% from current levels even in this worst-case scenario.” From peak to trough, the Standard and Poor’s 500 index of stocks declined 56.8 percent from October 9, 2007 to March 9, 2009. Lehman Brothers was one of the Roman candles in the blazing fireworks factory, filing bankruptcy in September 2008. The article also quotes a Citigroup analyst, Tobias Levkovich, stating that stocks are “screamingly cheap relative to bonds.” Treasury bonds would skyrocket in value over the next year as a safe haven play against a crashing stock market. Citigroup would receive the largest taxpayer bailout in U.S. history and become a penny stock, at one point trading at 99 cents. It might also be instructive to examine the other text on this climb-out-on-a-skinny-rickety-limb front cover. We’re drawn to the headline on the left side bar indicating that “Hampton rentals, only $1 million.” The Hamptons is a popular beach area at the east end of Long Island where the Wall Street’s money set likes to flock in the summer. A $1 million rental for the short summer season sounds emblematic of a market top. Then there is the text under the big headline that explains that two reasons for the optimism at Barron’s are “rising home sales and an economy that continues to grow.” Last Friday Bloomberg reported that owners are heading for the exits in Miami’s condo market as inventory piles up. On the same day, the U.S. Commerce Department reported that the economy is growing at a pace barely able to fog a mirror, an 0.8 percent annual rate. If an 0.8 percent growth rate sounds compatible to you with a $1 million summer rental, you might be just the customer for a $5 issue of Barron’s.